The Lifetime risk of hodgkin lymphoma article can now be found on the Hodgkin lymphoma risk page. In males in the UK, hodgkin lymphoma is the 19th most common cancer (less than 1% of all new male cancer cases). In females in the UK it is not among the 20 most common cancers (less than 1% of all new female cancer cases). 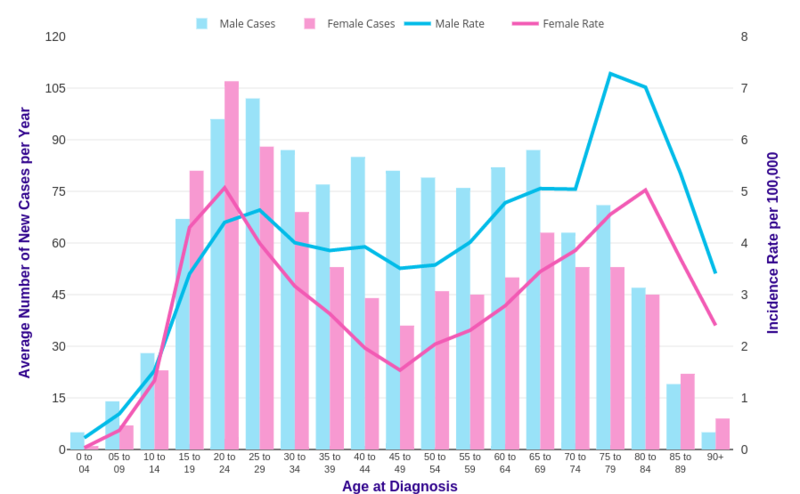 57% of hodgkin lymphoma cases in the UK are in males, and 43% are in females. Hodgkin lymphoma incidence rates (European age-standardised (AS) rates ) are similar to the UK average in all the UK constituent countries. For hodgkin lymphoma, like most cancer types, differences between countries largely reflect risk factor prevalence in years past. Data is for UK, 2015, ICD-10 C81. Age-specific incidence rates rise sharply during childhood and peak first in young adults aged 20-24. Rates then decrease until middle age before rising again to reach a second peak. The highest rates are in the 75 to 79 age group for males and the 20 to 24 age group for females. Incidence rates are significantly higher in males than females in a number of (mainly older) age groups. The gap is widest at age 0 to 04, when the age-specific incidence rate is 6.7 times higher in males than females. For Hodgkin lymphoma, like most cancer types, incidence increases with age. This largely reflects cell DNA damage accumulating over time. Damage can result from biological processes or from exposure to risk factors. A drop or plateau in incidence in the oldest age groups often indicates reduced diagnostic activity perhaps due to general ill health. Data is for UK, 2013-2015, ICD-10 C81. Hodgkin lymphoma European age-standardised (AS) incidence rates for males and females combined increased by 35% in the UK between 1993-1995 and 2013-2015. [1-4] The increase was of a similar size in males and females. For males, Hodgkin lymphoma AS incidence rates in the UK increased by 32% between 1993-1995 and 2013-2015. For females, Hodgkin lymphoma AS incidence rates in the UK increased by 40% between 1993-1995 and 2013-2015. 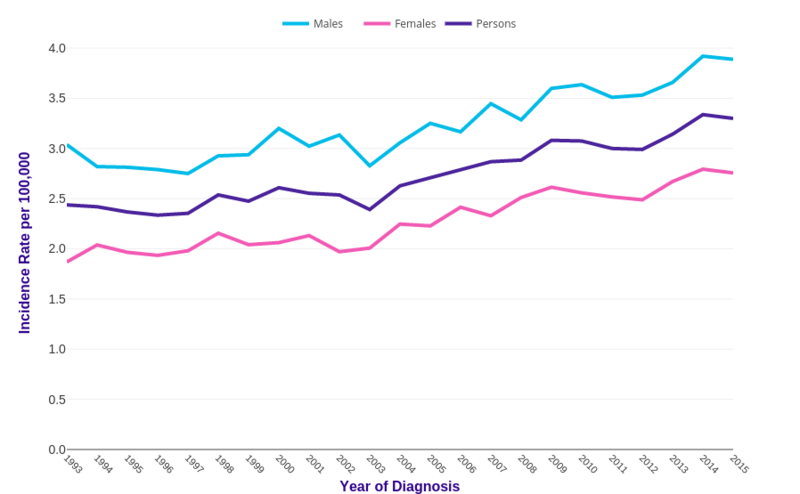 Over the last decade in the UK (between 2003-2005 and 2013-2015), Hodgkin lymphoma AS incidence rates for males and females combined increased by 27%. In males AS incidence rates increased by 26%, and in females rates increased by 27%. 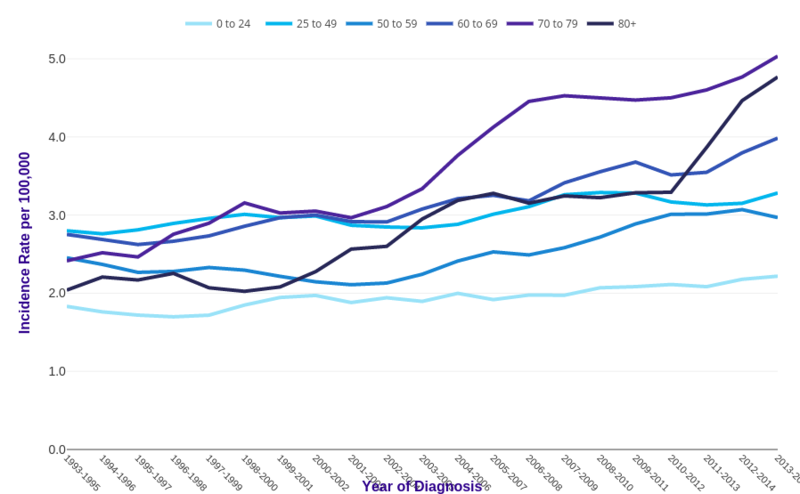 Hodgkin lymphoma incidence rates have increased overall in all broad age groups in males and females combined in the UK since the early 1990s. [1-4] Rates in 0-24s have increased by 21%, in 25-49s have increased by 17%, in 50-59s have increased by 21%, in 60-69s have increased by 45%, in 70-79s have increased by 108%, and in 80+s have increased by 134%. For Hodgkin lymphoma, like most cancer types, incidence trends largely reflect changing prevalence of risk factors and improvements in diagnosis and data recording. Recent incidence trends are influenced by risk factor prevalence in years past, and trends by age group reflect risk factor exposure in birth cohorts. Data is for UK, 1993-2015, ICD-10 C81. Staging for Hodgkin lymphoma most commonly uses the Ann Arbor system. Data by stage are not yet routinely available for the UK due to inconsistencies in the collecting and recording of staging data in the past. However this is improving and plans for a nationally consistent dataset in England are underway. In the meantime, incidence by stage is available for the former Anglia Cancer Network in the east of England for the period 2004-2008. Anglia covers around 5% of the population of England and may not be representative of the country as a whole due to differences in underlying demographic factors (such as age, deprivation or ethnicity), as well as variation in local healthcare provision standards and policies. Over half (55%) of men and women diagnosed with Hodgkin lymphoma present at stage I or II. For around a sixth (17%) of patients, the stage is not known. Smithers DW. Summary of papers delivered at the Conference on Staging in Hodgkin's Disease (Ann Arbor). Cancer Res 1971; 31(11):1869-70. Data were provided by The National Cancer Registration Service, Eastern Office on request. ASR calculated with ESP2013. Not comparable with ASRs calculated with ESP1976. Data were provided by ISD Scotland on request, April 2015. Similar data can be found here: http://www.isdscotland.org/Health-Topics/Cancer/Publications/index.asp. Data were provided by the Northern Ireland Cancer Registry on request, March 2015. Similar data can be found here: http://www.qub.ac.uk/research-centres/nicr/. Hodgkin lymphoma incidence rates are projected to rise by 5% in the UK between 2014 and 2035, to 4 cases per 100,000 people by 2035. This includes an increase for males and a drop for females. For males, Hodgkin lymphoma European age standardised (AS) incidence rates in the UK are projected to rise by 9% between 2014 and 2035, to 5 cases per 100,000 by 2035. 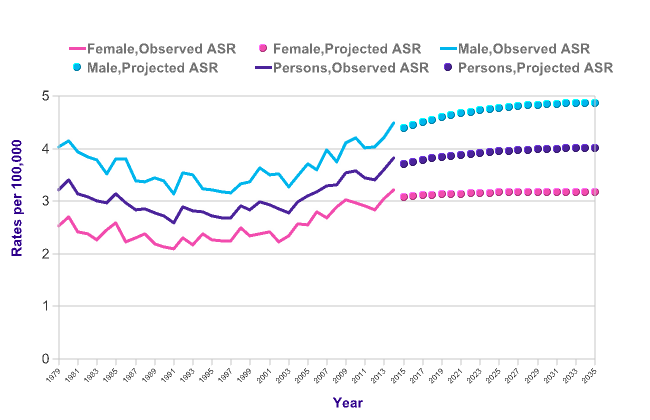 For females, rates are projected to fall by 1% between 2014 and 2035, to 3 cases per 100,000 by 2035. It is projected that 2,473 cases of Hodgkin lymphoma (1,480 in males, 993 in females) will be diagnosed in the UK in 2035. There is evidence for an association between Hodgkin lymphoma incidence and deprivation for males in England, but there is no evidence for an association for females. England-wide data for 2006-2010 show European age-standardised incidence rates are 20% higher for males living in the most deprived areas compared with the least deprived, but for females the rates are similar for those living in the least and most deprived areas. For males diagnosed with Hodgkin lymphoma the deprivation gradient has gone from having higher incidence rates in the less deprived in 1996-2000 to having higher incidence rates in the more deprived in 2006-2010. 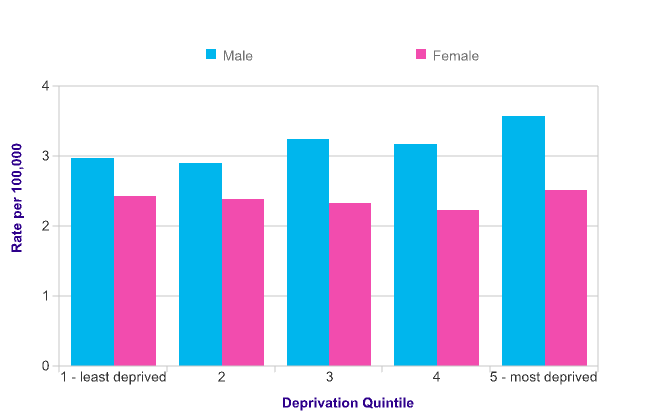 The estimated deprivation gradient in Hodgkin lymphoma incidence between females living in the most and least deprived areas in England has not changed in the period 1996-2010. It has been estimated that there would have been around 50 more cancer cases each year amongst males in England during 2006-2010 if all males experienced the same incidence rates as the least deprived. Age-standardised rates for White males with Hodgkin lymphoma range from 2.7 to 3.0 per 100,000. Rates for Asian males are similar, ranging from 2.7 to 4.7 per 100,000 and the rates for Black males are also similar, ranging from 1.8 to 3.8 per 100,000. For females there is a similar pattern - the age-standardised rates for White females range from 1.9 to 2.2 per 100,000, and rates for Asian and Black females are also similar ranging from 1.6 to 2.9 per 100,000 and 1.3 to 2.7 per 100,000 respectively. There appears to be no significant variation in Hodgkin lymphoma incidence by ethnicity in the UK. Ranges are given because of the analysis methodology used to account for missing and unknown data. For Hodgkin lymphoma, 6,399 cases were identified; 17% had no known ethnicity. An estimated 21,600 people who had been diagnosed with Hodgkin lymphoma between 1991 and 2010 were alive in the UK at the end of 2010.